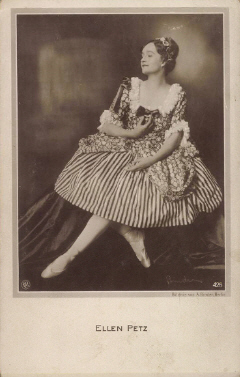 The actress and dancer Ellen Petz belonged to the cofounders of the organisation "Bund für Körperbildung e.V." 1917, who dedicated to the motion art. As a dancer Ellen Petz appeared on many staged and because of her popularity she got offered a role in the movie "Exzellenz Unterrock" (21). In this movie she played Madame Pompadour at the side of Adele Sandrock, Guido Herzfeld, Albert Steinrück and Paul Günther. It remained her only film role. Only in 1942 she worked again for a movie, this time as a choreographer for the production "Andreas Schlüter" (42) directed by Herbert Maisch with Paul Dahlke, Ernst Fritz Fürbringer, Heinrich George and Valy Arnheim in the leading roles. Ellen Petz was married with the actor Jasper von Oertzen.